During the last HR Xpo event in Brussels, ihop organized two online events with leading consultants in the domain of digital transformation. Herewith the report. It was for my company the first time ever to be present on a trade show. We had a nice booth in the exhibition hall. 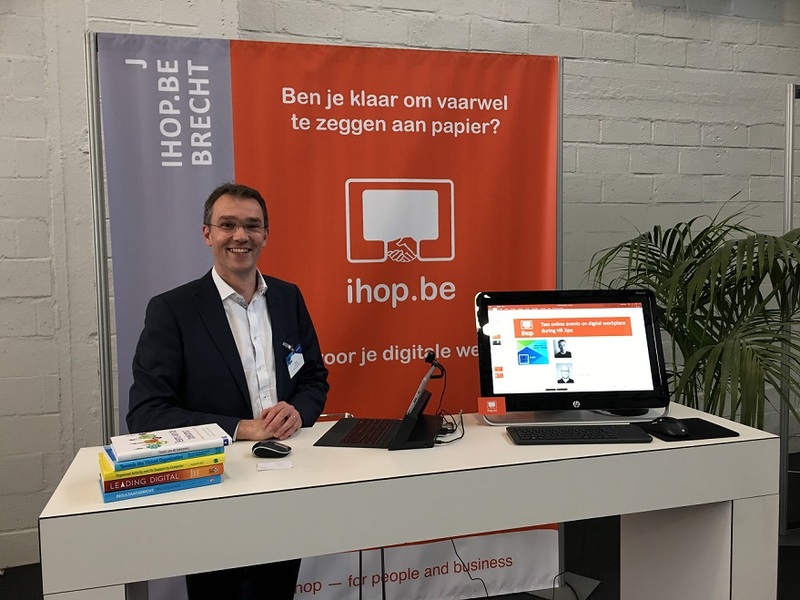 The tagline we used during the event was: “Are you ready to say goodbye to paper”, since the idea behind ihop is to assist companies in optimizing their digital workplace. But of course, a key element in that digital workplace, is about meeting people online, and having meaningful interactions via tools such as Skype and Google Hangouts, so why not adding some digital in the mix? That’s why we organized two online “digital events” during the trade fair. In this report I will cover the content of the events, but also all the tools that were used to make these events possible. People in the room, listen to a person presenting in front. Presenter uses an overhead projector for his slides. Pretty simple, this is how we’ve all done them. You need to be phisically present to participate. Attendees have made a considerable effort (time & money) to be there. But what about all these people that would love to hear the presentation, but they are too far away, or travel is just too expensive? Or you can also consider the case where a person has limited mobility, and just can not leave his home. All these people can not attend the talk. The exchange between speaker and audience is limited in time to the actual event. The attendees have often little or no information about the presenter before the event, the presenter has in many cases no information about the people attending the talk. The presenter will probably show his contact info in the final slide, and some people will go a talk to the presenter and maybe hand over their business cards. That’s about it. The interaction is often only in one direction: presenter talks, attendees listen. Questions can be asked at the end, but then many attendees are already thinking about the upcomming break etc, so no great interaction there. So let’s see what we can do with some digital technology. I had invited Lee Bryant, founder and director of the company POST*SHIFT in London to join me in the breakout session as a presenter. 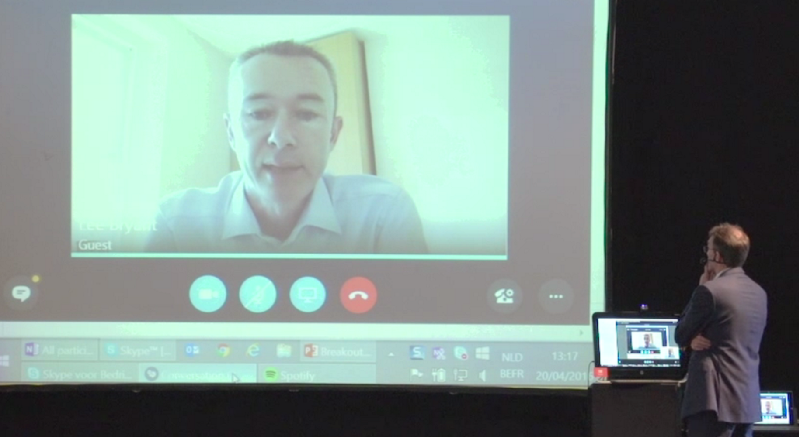 He was not going to jump on a train from London to Brussels to join me on site, but we used a Skype connection to do a joint presentation. But Lee was not alone online, of course he wasn’t. Six people have joined us online, also via the same Skype meeting Lee was in. They all could hear and see me and Lee. We have also used chat bit, and there was also a OneNote document in which the participants introduced themselves and could ask questions. Let’s now have a look at the content covered, then on the tools used. If the ESN is only used for conversation, then I can see the point that it is not adding enough value, and in fact it could also be wasting time. I think the real purpose of an ESN is first of all to join together people in the company, so that you can find the right people to get things done. Secondly you can then create individual communities and spaces where you can run projects, and you can collaborate directly with a smaller group of people. Because realistically you don’t collaborate with the whole company in all the work that you are doing. But I think there are two additional things that we are seeing in very advanced companies in these ESNs, that many of us can learn from. Firstly make the ESN a place where work actually happens. If it has enough features like wikis , and communities, and even some access to shared documents etc then you can actually work in the ESN and that means that you don’t need to take the extra step of sharing. Sharing becomes just a byproduct of your actual work. And I believe the really strategical role for ESNs, is to organize the conversation, across the organization, about how the organization is changing and how the organization should change. So we think of an ESN as a human sensor network, that can help you understand what is going well, what is not going so well. What processes are broken, what new capabilities could be required to succeed. This is the kind of strategic role that we would like to see HR play in what is previously an IT technical field or sort of internal communications field. I think HR really should be engaging with the user of the ESN, to constantly take the temperature of the employees in the company, and to generate ideas about small improvements that can move them to become more and more agile, and more connected company. Dedicated OneNote (free tool by Microsoft) setup for this event. I had two PC’s connected to the same Skype meeting on the stage: one for the audio out (going into the PA system), and one for the audio input (my mic). Both PC’s had video. People joining online used Skype. Some of them had technical issues (e.g. with company firewalls). The event with Lee was short (due to limited timing of the breakout concept), but it all worked: both the live audience and the online audience to hear and see both Lee and me. The exchange worked. The mailinglist to communicate with the participants worked. The OneNote document worked as well, but there was limited interaction except from e.g. the introductions by each participant. There was no real conversation afterwards, but I could have invested more effort to keep this exchange going. The audio and especially video on site can also be improved: the mic of my desktop PC did not pick up all I said, and I was often not on the video. A manned video camera, and an audio connection straight from my stage microphone into the Skype would have been an improvement. But for me the most important take away, is that to manage such an interaction, both online and live, you need to be at least with two people: now I did it all on two PC’s, but that’s just too much. 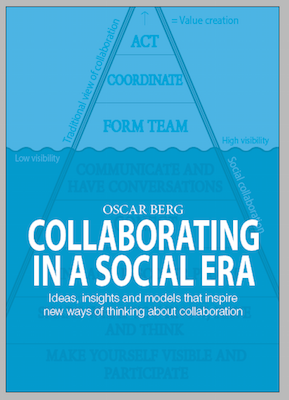 The next day, Oscar Berg, the Swedish author of Collaborating in a Social Era, paid me a visit at the booth. Of course, no need for car, plane or train like a “classical” booth visit: we used Google Hangouts. Note: if you purchase the book via the site of the publisher, and you use the discount code “ihop”, you get no less than 40% reduction. This is a screenshot of the call with Oscar at the PC. The tricky thing was that I needed my headset to hear Oscar and to talk to him, but then people next to me at the booth, who were going to participants to the event, could not hear him. What I needed (and did not have with me), are these small external PC speakers, and a second PC connected to the same Google Hangout. It was SUPER to add this digital layer to a live event: it offers great opportunities for interactions with people who could otherwise not be there. But also: combining all those tools and making them work together is (and here I also quote Lee in his follow up), still much more complex that in should be. I loved your enthousiasm and honesty in this article (telling also things that went wrong, and how to do better next time). A lot of innovative ideas, you have, for me some more concrete examples would help. Hi Michael, thanks for the compliments! As to more concrete examples of digital events: I run all my OneNote trainings this way (both the sessions that happen ‘live’ in a class room, as the online trainings). This means that for each training I use a combination of tools to support the training experience and the exchange of information: email (or the messages in Office Groups) for basic communication, OneNote for full interaction (including slides, excercices, Q&A) and Skype for the online event. What to learn more? 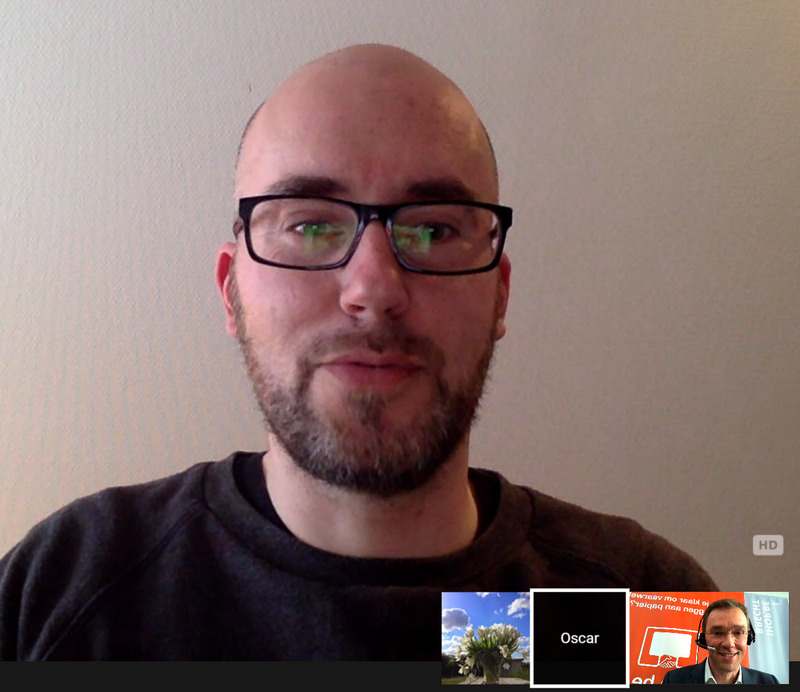 Let’s do a short online meeting using Skype, Appear, Zoom, Hangouts or any tool of your choice!